The idea of taking a photo of yourself each day is now commonplace. Many people do it anyway without thinking, due to the advent of smartphone cameras. But how long could you keep it up? Two months? Six? A year? How about 45 years? Then you’d be in Melissa Shook’s territory. 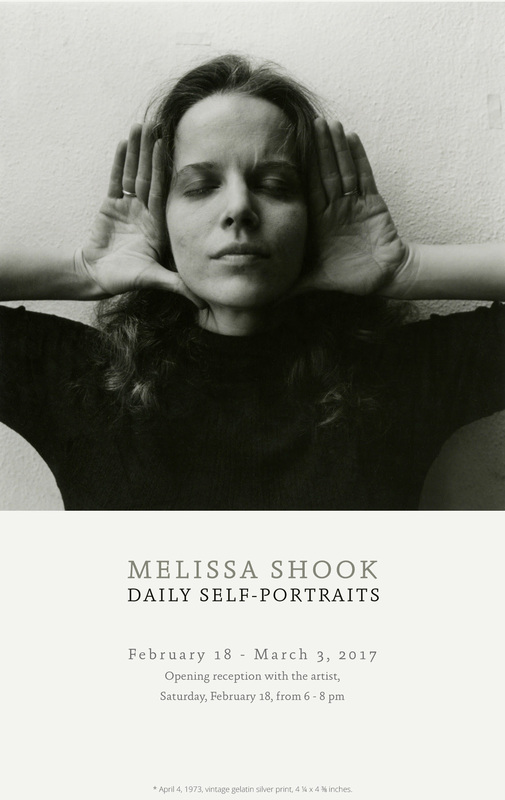 In 1972, curious about the problem of identity, Shook began an ambitious project of photographing herself everyday for a year. The sum of this impressive undertaking resulted in a compelling set of intimately scaled black and white photographs that range from the artist performing for the camera, to the camera describing the physicality of her being. These early influential photographs will be complimented with a selection of recent daily photographs from 2014-15 that combine individual text entries with a self-portrait image; both text and image act as a diary, reflecting upon the complexities of the human condition. Along with her daily portraits, the gallery will be exhibiting a collection of her extended portraits of her daughter Krissy in her teen years, and a compilation of her video pieces. The exhibition in its entirety explores notions of change and aging, as well as photography’s ability to form an extended document to reveal these qualities. A photographer, video artist, and writer, Melissa Shook has taught photography at the Creative Photography Lab, at MIT and at the University of Massachusetts, Boston. Shook’s photographs have been exhibited in numerous solo and prestigious group exhibitions, including: Pictures by Women: A History of Modern Photography (MOMA 2010) and Photography in Boston 1955-1985 (Decordova Museum). Among her awards are a National Endowment for the Arts Visual Fellowship, an Arts in Action Grant and a Polaroid Foundation Grant. The exhibit will open February 18 with an opening reception with the artist from 6-8pm. It will be on display until March 31st.